Crepes can be used as a main meal, dessert or even in soup! Scroll down for no-fail recipes for basic, sweet and savory crepes as well as recipes for two of my favorites, Seafood Crepes and Orange Crepes Souffle (easier than it sounds). Serve these to your family or to guests and take a bow!! Bon Apetit!! Heat a small non-stick pan and add butter to coat. Pour one ounce of batter into the side of the pan and swirl quickly to spread batter evenly. Cook for 30 seconds and flip. Cook for another 10 seconds and remove to cool on a flat surface. Add ¼ teaspoon salt and ¼ cup chopped fresh herbs, spinach or sun-dried tomatoes to the egg mixture. In a large mixing bowl, blend the flour, egg, sugar and salt with a wooden spatula. Gradually add the milk , stirring constantly. In a nonstick crepe pan, about 5 or 6 inches in diameter, melt the butter and add it and the vanilla extract to the crepe batter, stirring constantly. Strain through a fine sieve. In the same crepe pan over medium heat, add about 2 tablespoons of the batter, rotating the pan to make sure that the bottom is fully covered with a thin layer of batter. Cook for 45 seconds to 1 minute (the crepe should be lightly browned). Turn over and cook about 30 seconds more. Transfer to a flat surface. Add more batter and repeat until finished. A sweet variation: Add 2 ½ Tablespoons sugar, 1 teaspoon vanilla extract and 2 Tablespoons of your favorite liqueur to the egg mixture. Place the flour and sugar in a medium-sized mixing bowl. Slowly whisk in the milk, egg, vegetable oil and butter. Heat a nonstick pan or crepe pan over moderate heat. Brush the pan lightly with butter. Pour ¼ cup of the crepe batter into the center of the hot pan and tilt it in all directions. The batter should lightly cover the bottom of the pan. After about 30 seconds, the bottom side of the crepe should be lightly browned and the crepe should be ready to be flipped. 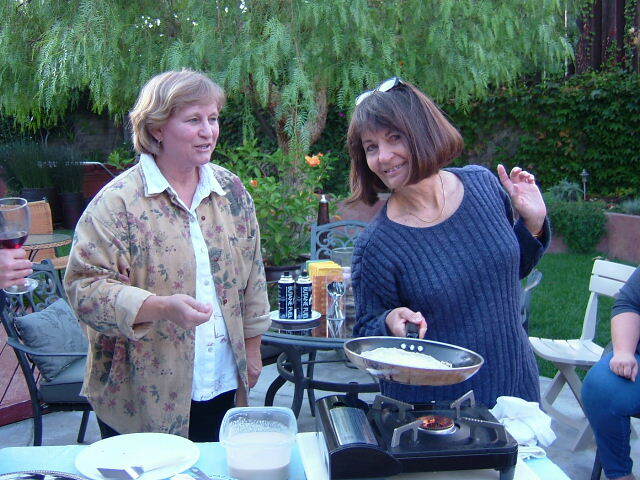 Shake the pan in order to release the crepe, then turn it by using a spatula or the flip of your wrist. Cook the crepe for an additional 15 to 20 seconds and turn it out onto a plate. Repeat this process with the remaining crepe batter. 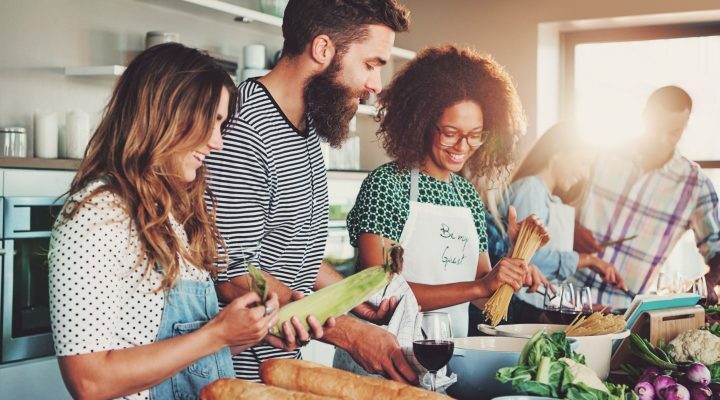 In a small saucepan, bring the white wine to a boil and reduce by half. Add the cream and bring it to a boil. Mix the cornstarch together with the cold water and whisk it into the cream and wine mixture until thickened. Season to taste with the spices and Tabasco. You only need a little. Let cool. In a large mixing bowl, place the crab, shrimp and chopped egg and toss together lightly. Fold in the thickened cream mixture and season to taste with salt and pepper. Add parsley. Place about 3 Tablespoons of filling into the center of a finished crepe. Fold sides up over filling and turn over so that the seam sides are down. Place into a gratin dish or other serving dish. 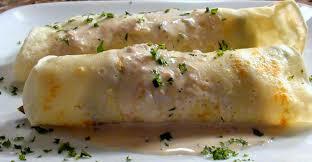 When you have completed all the crepes that you want to serve, top completed crepes with a drizzle more of sauce and add a sprinkle of grated Aged Gouda or other flavorful hard cheese such as Pecorino Romano cheese to the top. Quickly place in a 400-degree oven for just a few minutes (5 to 6), just to heat through and blend the cheese flavor. Put the egg yolks in a mixing bowl and add ¼ cup sugar, orange rind, orange juice, cornstarch and Grand Marnier. Beat briskly with a wire whisk until very smooth. Beat the egg whites until stiff. Toward the end, beat in the remaining sugar and continue to beat until peaks form. Add about ¼ of the egg whites to the orange mixture and beat quickly with a wire whisk to blend. Add the remaining egg whites and fold them in with a rubber spatula. Butter a baking dish large enough to hold the 8 filled crepes in one layer. Using a flat work surface, spread the crepes out, fill them evenly with the orange mixture and roll up. Arrange the filled crepes in the baking dish. Brush them with the melted butter. Place the baking pan in the oven and bake for 10 minutes or until slightly brown on top. Sprinkle with confectioners’ sugar and serve.